Merry Christmas. I hope you had a wonderful time with loved ones. Santa only comes to children who nice, not naughty, and so he nearly passed our household. Well, perhaps I am being harsh. But sometimes late Christmas Eve activities, in our case a church service, and young children don’t mix. Taiwan kids go to sleep late. Mum and Dad usually do a lot of overtime, so don’t come home until after dinner time. And as many families co sleep, the kids stay up until the parents go down, or at least close enough. When we first came to Taiwan three and a half years ago, I naively thought I could keep putting my eldest down to sleep at 7.00pm like in Australia. Well, that stretched to 7.30pm, then 8.00pm, then 8.30pm and now we are lucky if he goes down by 9.30pm. Often it is later. In part this is because of the long nap he has of an afternoon at preschool. He also is in no rush to get up of a morning. But Little A goes down every night at 8.00pm. He doesn’t always go to sleep straight away, but 8.00pm is when he starts to get silly. We can almost time it to the minute. 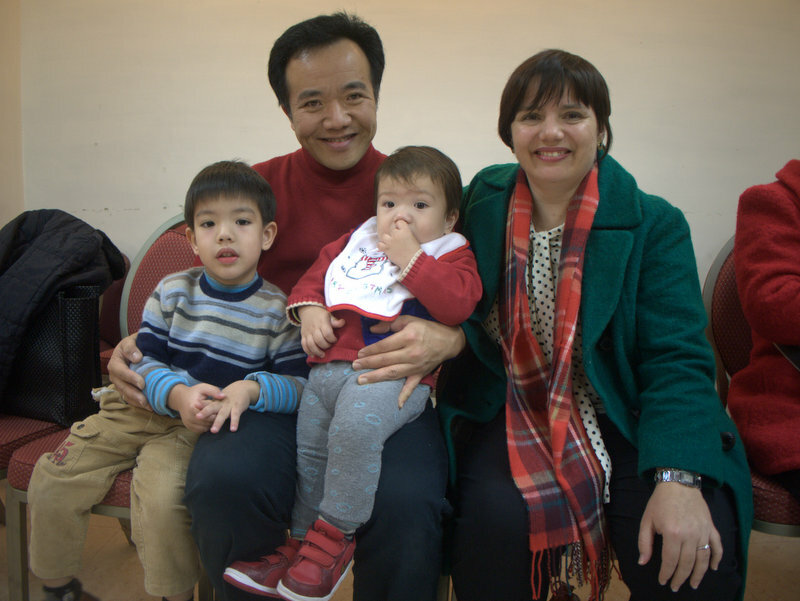 The Christmas Eve service at the Salvation Army Central Corps, Taipei, started at 7.30pm. In retrospect, perhaps a bit ambitious for us. But, hey, it was Christmas and Big A was in the nativity play. He had been sick with a cold and fever for nearly six days beforehand had missed rehearsals, but because his role was a sheep he didn’t need to do much. Big A dressed as a sheep before the nativity play. Notice the trays of decadent cakes for supper. Actually, Little A was supposed to be a sheep as well but it was past 8.30pm by the time the nativity play got away and he was getting cranky. 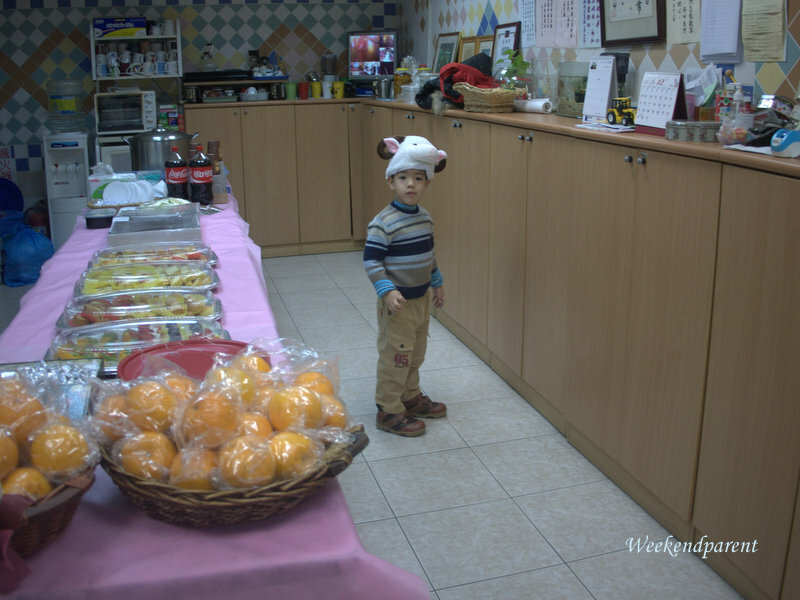 I couldn’t even get the sheep hat on him; he would squirm and grab it off me whenever I tried. And he would not sit still. His favourite game was to run to the back of the church, through the glass doors and onto the busy street. As it was a dark, rainy night this wasn’t an especially safe game for a toddler. And he didn’t enjoy being brought back. Tantrums resulted. Big A performed well on stage as a sheep. Apparently. I missed most of the key moments as I was running around after Little A. We tried everything to get Little A to behave: bribing him with cookies, giving him a toy to play with, cuddling him, letting him play with a poodle dog, and even letting him run a bit (but not on the road). But he was hyperactive, overtired and overstimulated. And when the Minister said “let us pray”, little A let out an almighty howl. Which would have been funny had we not been at church. So I took both kids downstairs to the safety of the kitchen area, where there was a playmat set out for toys. I thought they would be happy, but no, Big A was terribly upset about the absence of his favourite toy. Big A has poor fine motor skills (and he is uncoordinated generally), as a result probably of being born two months premature. I don’t think it is too major a problem, but hubbie frets about it. We have a range of games for him to play with to help his coordination. At church I encourage him to play with threading shoe laces through holes in pictures. He loves this and will sit and play it for ages, even if he if very slow with it. But on this occasion I could find the pictures, but not a single shoe lace. I could not believe it: surely they would be somewhere? Big A kept whingeing and crying and pulling on my clothes begging me to find the shoelaces. I was starting to feel frazzled. I took a deep breath and resolved to implement my recent mindfulness training and do one thing at a time. So I started going through the boxes in the cupboard slowly searching for the shoelaces. Once I found them, I was sure that peace would ensure. Bad move. I could not find those shoelaces anywhere. Later, I realized they had probably been utilized in the headwear costumes for the nativity play as they were perfect for securing Joseph and Mary’s headdresses. And there was also an important lesson here that this weekendparent had to learn: never, ever turn your back on young children, even if you think they are occupied with toys. I was so upset I could have cried. How could I not have noticed? What a bad mother I am! What a disaster! Now surely Christmas Eve will be ruined for everyone. “Go get Daddy. Now!” I ordered Big A. Thankfully, he complied dutifully. And hubbie came straight down and helped me clean up the mess. Thankfully also he did not berate me for not keeping a closer eye on the boys. He could see that they were in a sugar-hyped, over-excited and tired state and that only going home could cure that. But we could not go home, not yet. Apart from the fact that it was a special, Christmas Eve service, husband had a special red-coated, white-bearded role to play. All the kids were waiting on him. And this was not until right at the end of the service. Let me down! I want to run around, preferably out the door and onto the street. So I took the kids upstairs. I didn’t want them to upset any more cakes, and I also didn’t want them to see Daddy turning into Santa Clause. They did not want to sit still, especially Little A, so this was not an easy task. I was lucky that our Minister, who adores children, assisted in holding Little A for me for a while, but still it was exhausting work. “Your child is very active,” one lady said, as she calmly cuddled her own quiet, angelic toddler. 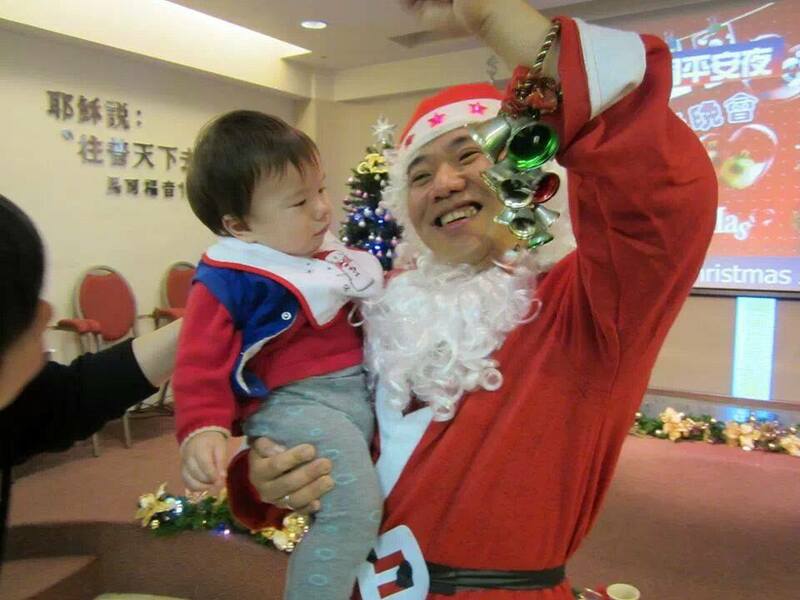 Indeed, compared with the average Taiwanese kid he is very active, and strong. I think I was also pretty headstrong when I was a toddler. Finally, Santa Claus arrived. “Ho, ho ho,” he laughed. Big A wasn’t sure what to make of Santa’s arrival. It didn’t help that other kids ‘helpfully’ pointed out that the looked a lot like Big A’s Daddy. But he was excited by the presents, especially the lollies and the blinking rubber duckie pen. But Little A was distraught by this stranger in a big white beard. He cried uncontrollably. Then, suddenly, the stranger pulled down his beard: yes, it’s Daddy! He’s not a stranger afterall! Little A started laughing. Little A went from tears to laughter in seconds once he realised the white-bearded stranger was Daddy. After some pictures with Santa (thankfully shortened by people understanding the need to get the kids home to bed), we whisked the little ones away. Usually Little A sleeps in the car, but not tonight. He was so hyped up he was still running laps around the kitchen when we got home just before 10.00pm, and took a little while to settle. But he did go down in the end. And so too did Big A, although I suspect he was still awake for a long time trying to stay up to hear Santa. The ‘real’ Santa, that is! And as for the cakes, well, there was little we could do. We contemplated running to a nearby cafe or bakery (Taipei is so convenient!) and buying a plate as replacement, but logistically with the kids that wired it was not really practical. So we confessed to the Minister and her husband, who were incredibly good about it. Really understanding. Thankfully she had prepared a lot of food, so I think there was still enough to go around. Looking back, it was perhaps a bit ambitious taking the little one to the service. I didn’t want him to miss out, and it was Christmas. I was thankful that they slept in until nearly 9.00am on Christmas morning, and that we had a quiet and unadventurous day playing with their new toys. Christmas peace restored. I just re-read this and it bought back memories — both the tears of frustration and embarrassment at Little A destroying the cakes, but also the warm memories of attending your church. Such happy days! We miss you so much.